Spirit and Opportunity landed on Mars January 3 and January 24, 2004 PST (Jan. 4 and Jan. 25 UTC). Both rovers lived well beyond their planned 90-day missions. 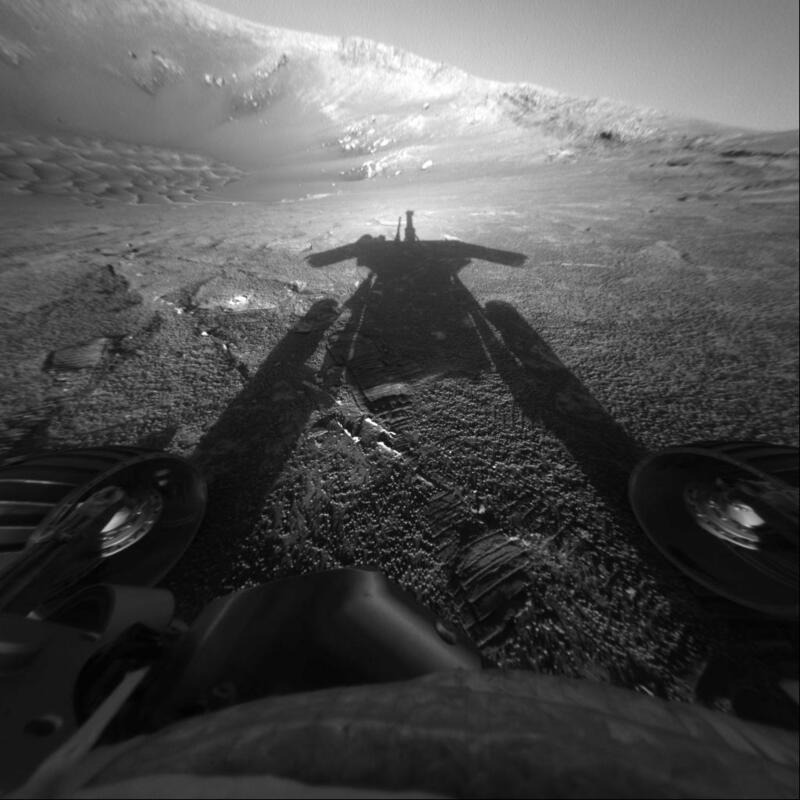 Opportunity worked nearly 15 years on Mars and broke the driving record for putting the most miles on the odometer. With data from the rovers, mission scientists have reconstructed an ancient past when Mars was awash in water. Spirit and Opportunity each found evidence for past wet conditions that possibly could have supported microbial life. Both rovers exceeded their planned 90-day mission lifetimes by many years. Spirit lasted 20 times longer than its original design until it concluded its mission in 2010. Opportunity has worked on Mars longer than any other robot—nearly 15 years. The rover last communicated with Earth on June 10, 2018, as a planet-wide dust storm blanketed the solar-powered rover’s location on Mars. In 2015, Opportunity broke the record for extraterrestrial travel by driving more than the distance of a marathon, with a total of 28.06 miles (45.16 kilometers). First among the mission's scientific goals was to search for and characterize a wide range of rocks and soils for clues to past water activity on Mars. The rovers were targeted to sites on opposite sides of Mars that looked like they were affected by liquid water in the past. Opportunity landed at Meridiani Planum, a possible former lake in a giant impact crater. Spirit landed at Gusev Crater, a place where mineral deposits suggested that Mars had a wet history. Each rover bounced onto the surface inside a landing craft protected by airbags. When they stopped rolling, the airbags were deflated and the landing craft opened. The rovers rolled out to take panoramic images. These images gave scientists the information they needed to select promising geological targets to tell part of the story of water in Mars' past. Then, the rovers drove to those locations and beyond to perform close-up scientific investigations. Landing in a crater, Opportunity scored a "hole in one" by finding the mineral hematite, which typically forms in water. Water is key to life as we know it. Yet, acidic water soaked this area in Mars' ancient past, making conditions harder for life to thrive. At a place called Comanche, Spirit found rocks ten times richer in key chemicals (magnesium and iron carbonates) than any other Martian rocks studied before. These rocks formed when Mars was warm and wet (had a thicker carbon-dioxide atmosphere and near-neutral-pH water). This warmer, watery environment could have supported life much better than the harshly acidic conditions the rover found elsewhere. While dragging a wheel, Spirit churned up soil and found 90 percent pure silica at "Home Plate." On Earth, this kind of silica usually exists in hot springs or hot steam vents, where life as we know it often finds a hot, happy home. Perhaps ancient microbes on Mars did as well. Spirit discovered that an ancient volcano erupted at "Home Plate," the rover's final resting place. Together, powerful steam eruptions from heated underground water produced some explosive volcanism. While violent, these extreme conditions can support microbial life on Earth. Once upon a time, maybe they did on Mars. Score! Near the rim of Endeavor Crater, Opportunity found bright-colored veins of gypsum in the rocks. These rocks likely formed when water flowed through underground fractures in the rocks, leaving calcium behind. A slam-dunk sign that Mars was one more hospitable to life than it is today! Opportunity found compelling signs of a watery past on Mars: clay minerals formed in neutral-pH water. Of all the places studied by Opportunity, this environment at Endeavor Crater once had the friendliest conditions for ancient microbial life. for determining the mineralogy, texture, and structure of the local terrain. for identifying promising rocks and soils for closer examination and for determining the processes that formed Martian rocks. The instrument is designed to look skyward to provide temperature profiles of the Martian atmosphere. for close-up investigations of the mineralogy of iron-bearing rocks and soils. for close-up analysis of the abundances of elements that make up rocks and soils. for obtaining close-up, high-resolution images of rocks and soils. for removing dusty and weathered rock surfaces and exposing fresh material for examination by instruments onboard. NASA'S Mars Exploration Rover Spirit captured this westward view from atop a low plateau where Sprit spent the closing months of 2007. Each rover was created to be the mechanical equivalent of a geologist walking from place to place. The mast-mounted cameras are 5 feet (1.5 meters) high and provide 360-degree two-eyed, humanlike views of the terrain. The robotic arm moves like a human arm with an elbow and wrist, and can place instruments directly up against rock and soil targets of interest. The mechanical "hand" of the arm holds a microscopic camera that serves the same purpose as a geologist's handheld magnifying lens. The Rock Abrasion Tool is like a geologist's rock hammer that exposes the insides of rocks.